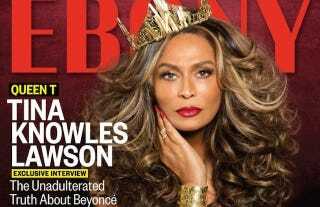 ***TRIPLE ALARM EMOJI*** Tina Knowles Lawson is covering the July issue of Ebony. Is she your mother? ...Knowles Lawson also matter-of-factly shares that she is not—and has never been—a kept woman. She’s on no one’s payroll, thank you, and she wants it that way. Beyoncé certainly doesn’t pay her, at least not in cash. The breathtakingly gorgeous grandmother does Pilates five days a week and has a ravishing body (not for her age, but period; see exclusive EBONY photographs); is in talks for a TV show about “getting your groove back;” does a daily morning prayer; works with charities to support the homeless; and is a self-taught, avid Black art collector and historian (who owns originals from greats such as Romare Bearden, Elizabeth Catlett and John Biggers). “Tenie B,” her nickname since childhood, shares that she was mistreated by Black nuns in elementary school, took off solo to California at 18, and by 34, with little ones in tow, opened one of the biggest, baddest Black hair salons Houston had ever known. Mom, you look and sound great. Please answer the text I just sent.